We offer quick-turn fabrication of touch sensor modules at our prototyping facility in Santa Clara, California. Turnaround times for many designs can be as little as 2 weeks due to our unique direct-laser patterning process. This can greatly reduce the development time for a new sensor project and can help bring your product to market sooner. Our 1,200 sq. 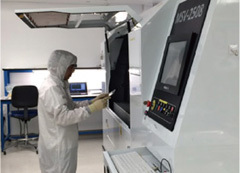 ft. Class 10,000 cleanroom facility has all equipment required to assemble custom modules from start to finish. We stock a range of raw materials that are required for module fabrication, including ITO-coated glass and various sizes of Gorilla™ and Dragontrail™ Cover Glass. 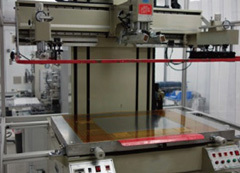 In addition to glass substrates, we also pattern on ITO-coated film and other transparent conductive films (TCFs) such as Silver Nanowire-, Carbon Nanotube-, Carbon Nanobud-based. With our state-of-the-art machines and tools, we are able to fabricate fully functional touch sensors and laminate with LCD. 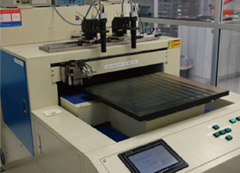 As a prototype facility, we also offer various single-process services, such as laser patterning on glass/film, FPC bonding, glass cutting, substrate lamination, and LCD lamination.